The house of sick is alive and well! Between Hubs being sick, Miss H having a virus, then passing it to me, but in my eye to have viral conjunctivitis only to then have to go back to the doctor this week to have what an Urgent Care doctor call “Eczema” on my finger apparently was an infection (#Squashhands) OH and a kidney infection. Ya’ll, a week before my birthday I should not be falling apart! But I am here to share with you my Friday Five, we actually had a pretty good week despite our crazy sickness. We skipped swimming for the week because so much could have gone terribly wrong and glasses in a pool don’t jive. So, I offer you my Friday Five. Let’s hope I can share next Friday with a little less sick! 1) Advent by Candlelight – On Monday night, I attended Advent by Candlelight at my MOPs church. I had never heard of such an event and I now noticed it was all over the place in St. Louis! We basically got together at a table, brought a favorite appetizer and had fellowship with other ladies. I knew about half of the table from my MOPs group and we had a great time. Great way to put yourself in the Christmas mood and not with all the materialistic stuff. Don’t mind my wonky eye. That was just the beginning of the crazy that me and this eye went through this week! Side note, I totally love this sweater. It’s so roomy and comfy. They also have it in solids. 2) Cookie Exchange! – I’m super excited to be hosting a Cookie Exchange at my house on Sunday with some of my favorite ladies! In partnership with Folgers, we’ll be swapping cookies, drinking coffee and I’ll get to show everyone all about Perfect Measures. I think I’ll be whipping up Red’s Amazing M&M Cookies because they are just too good! I’ll have a full recap next week! 3) Miss H – Um, when did my baby get so big? (Ignore less wonky eye) I feel like she’s just a big kid in a little body and I’m fully anticipating the word bursts that are going to happen here soon. She’s getting really good with words. Yesterday, I said money, and that’d been the word of the day. Daddy just rolled his eyes. Does she just look so tall. I can’t even. When we went to the doctor last week she was 26.6lbs. I can’t even remember what she weighed at 18 months, but hello 2 years old in 1 month and 5 days. 4) Birthday Week! – Next week is officially my Birthday Week! I know, at the ripe old age of almost 34, I shouldn’t be celebrating a whole week. I’m changing things up big time this year and skipping our annual Gin & Juice for Jen & Jesus Christmas Party and moving it to a lovely dinner party out. A small handful of people are coming and then it’s back for DQ Ice Cream Cake and maybe around of Cards Against Humanity. I had no energy to put a huge party together and I really loved how we celebrated my BFFie’s birthday this year, with a nice intimate dinner with friends. I’m excited because I have Barre in the morning and then I’m being treated to a morning at the spa with a facial and mani/pedi. Then it’s out to dinner that night. Talk about wonderful! Oh, and don’t forget to enter my Birthday Giveaway from Freshly Picked! 5) Pajama Party Link Up! – I’m excited to be co-hosting a Pajama Party Show Down next week! 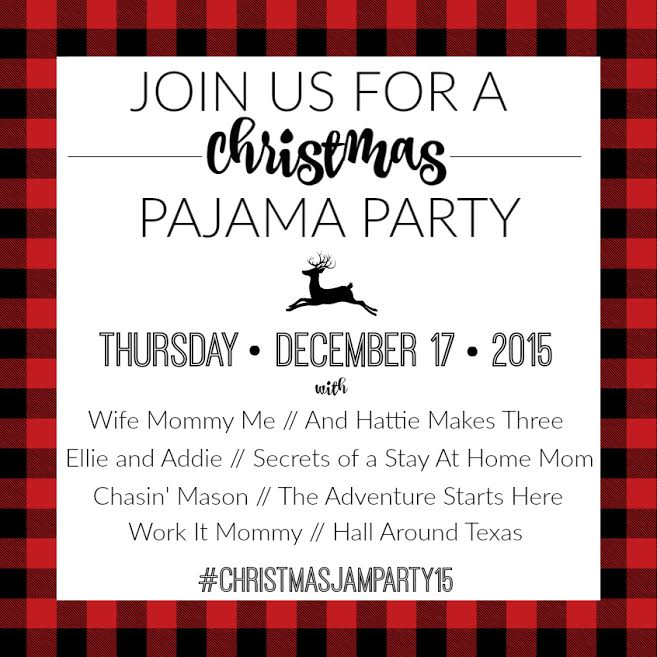 Don’t forget to link up next Thursday to see all of the cute Christmas Jammies! Jen and Juice literally made me laugh out loud and almost spit out my coffee. That is so dang clever for a birthday celebration. Your birthday plans sound absolutely perfect! And you're not crazy, Miss H does seem bigger! In just the short time I have been following along, I feel like she has gotten super big in the last couple weeks! She is so adorable!! She has gotten so big 🙂 I am wondering the same thing with my little one too! Totally forgot about your G&J party, ha! Not a coffee fan but I'll have my cookies ready, see you then!